It was a full day of NBA basketball in honour of MLK day in the US. The Raptors were looking to bounce back from a tough loss against the Los Angeles Lakers. But the Raptors have a bad history with the Charlotte Bobcats with couple of the previous matchups decided on the final possessions and the Raps on the losing end. Today was no different; after falling behind by as many as 30 points, the Raps couldn't pull out the miracle and lost 100-95 to Charlotte. 11 Number of points scored by the Raptors in the first quarter. It was a season low for Toronto. 10 10 points and 10 rebounds for Al Jefferson in the first quarter. The Bobcats centre dominated Jonas Valanciunas for most of the game, finishing with 22 points and 19 rebounds. 190 Kemba Walker, who hit a buzzer beater to beat the Raptors back in December, ended his streak of 190 straight games when he was a no-go on Monday due to an ankle injury. 34 No Kemba? No problem. The Bobcats point guards Ramon Sessions and Janerro Pargo combined for 34 points (Session 23 pts, Pargo 11 pts). 30 It was an ugly three quarters for the Raptors, who got down by as much as 30 points with just a few minutes left in the third quarter. 36 The Bobcats held the Raptors to just 36 points in the first half, a season low for the Charlotte defence. 35 Number of points scored by the Raptors in the fourth quarter. 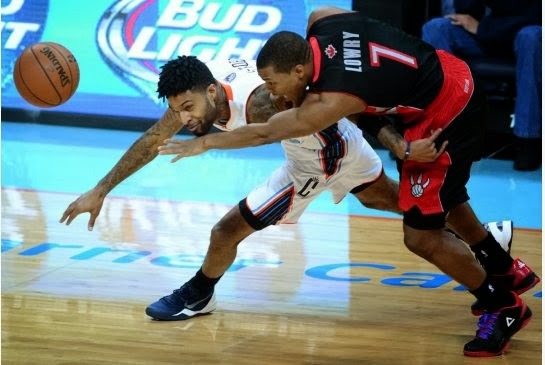 After scoring just 36 points in the first half, the Raptors woke up in the second half and made a furious run in the fourth quarter squashing the Bobcats 30-point lead. 5 Jonas Valanciunas, Terrence Ross, Amir Johnson struggled mightily on Monday and combined for a total of five points on 2/15 shooting. 12/13 Chuck Hayes was all hustle for the Raptors, filling in for a struggling Jonas Valanciunas. He did a good job defending Al Jefferson and scored 12 points and grabbed 13 rebounds. 36 The chemistry between the point guard combo of Kyle Lowry and Greivis Vasquez is starting to develop. The two PG's sparked a run in the fourth and combined for 36 points. Vasquez had one of his best games as a Raptor with 15 points, 7 rebounds and 9 assists. 9 Number of points scored by Steve Novak. The three-point specialist helped the second half run and went 3-3 from three point land. 1 After failing to tie the game up at the free throw line, we had one sad Kyle Lowry.